Behold the secrets of the world’s greatest conjurer! Stretch handkerchiefs! Bend spoons! Until his untimely death on stage in 1936, the Amazing Mr. Mysterio was one of the world’s most celebrated magicians—a brilliant showman who rivaled Harry Houdini and Howard Thurston with his astonishing performances. And now, with the publication of Mysterio’s Encyclopedia of Magic and Conjuring, his secrets are finally made known to the world. This giant compilation of techniques and variations features illustrated step-by-step instructions for card tricks, rope effects, mind-reading magic, stage illusions, and more. Readers will learn how to vanish coins, produce rabbits, predict the future, escape from captivity, and even make a person disappear. 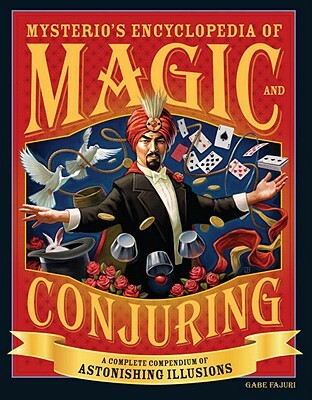 With effects ranging from intimate tricks to epic on-stage illusions, Mysterio’s Encyclopedia of Magic and Conjuring is an indispensable reference for magicians of all ages. Mr. Mysterio was the stage name of Alphonse Zenobius Rekulak, a Ukrainian immigrant to the United States who rose to become one of the world's foremost illusionists. He died in New York City in 1936. Gabe Fajuri serves as associate editor of MAGIC Magazine, the world's largest independent periodical for magicians. He is also the president of Squash Publishing, which produces scholarly and instructional titles on conjuring. He has written many books on the subject of magic and magicians, and he produces and consults on magic-related television programs, live events, and publishing projects. He lives in Chicago.